Cardiovascular complications are one of the major factors for early mortality in the present worldwide scenario and have become a major challenge in both developing and developed nations. It has thus become of immense importance to look for different therapeutic possibilities and treatments for the growing burden of cardiovascular diseases. Recent advancements in research have opened various means for better understanding of the complication and treatment of the disease. Adenosine receptors have become tool of choice in understanding the signaling mechanism which might lead to the cardiovascular complications. Adenosine A3 receptor is one of the important receptor which is extensively studied as a therapeutic target in cardiovascular disorder. Recent studies have shown that A3AR is involved in the amelioration of cardiovascular complications by altering the expression of 3AR. This review focuses towards the therapeutic potential of A3AR involved in cardiovascular disease and it might help in better understanding of mechanism by which this receptor may prove useful in improving the complications arising due to various cardiovascular diseases. Understanding of A3AR signaling may also help to develop newer agonists and antagonists which might be prove helpful in the treatment of cardiovascular disorder. Keywords: Adenosine A3 receptor, agonist, antagonist, cardiovascular disorder, signaling. Keywords:Adenosine A3 receptor, agonist, antagonist, cardiovascular disorder, signaling. Abstract:Cardiovascular complications are one of the major factors for early mortality in the present worldwide scenario and have become a major challenge in both developing and developed nations. It has thus become of immense importance to look for different therapeutic possibilities and treatments for the growing burden of cardiovascular diseases. Recent advancements in research have opened various means for better understanding of the complication and treatment of the disease. Adenosine receptors have become tool of choice in understanding the signaling mechanism which might lead to the cardiovascular complications. Adenosine A3 receptor is one of the important receptor which is extensively studied as a therapeutic target in cardiovascular disorder. Recent studies have shown that A3AR is involved in the amelioration of cardiovascular complications by altering the expression of 3AR. 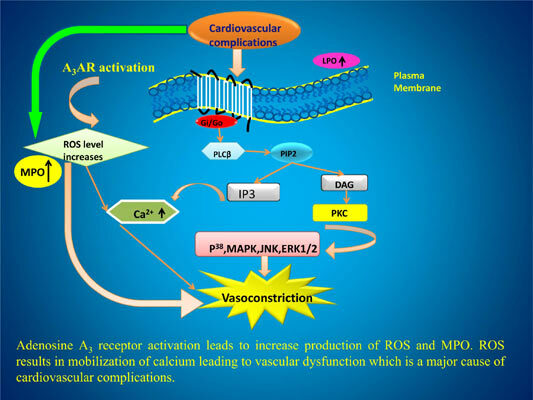 This review focuses towards the therapeutic potential of A3AR involved in cardiovascular disease and it might help in better understanding of mechanism by which this receptor may prove useful in improving the complications arising due to various cardiovascular diseases. Understanding of A3AR signaling may also help to develop newer agonists and antagonists which might be prove helpful in the treatment of cardiovascular disorder.